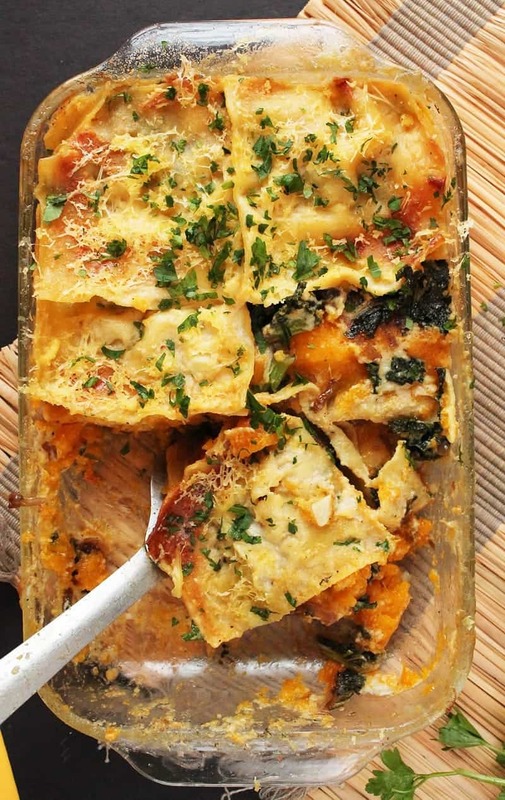 A fall-twist on a classic dish, this Vegan Butternut Squash Lasagna with bechamel sauce is the perfect dish for omnivores and vegans alike. Have you ever bought a beautiful butternut squash at the grocery store with the best intentions only to let it sit on the kitchen counter for weeks and eventually letting it get tossed it in the compost because it was attracting more fruit flies than inspiration? If you have, you are not alone. I used to have this problem so often I had to just stop buying squash all together. I know, I know, there are a hundred recipes to make with squash: soup, pasta, even cakes and brownies. But despite that, sometimes I feel taht the butternut squash is simply too intimidating. Is there a recipe worth it’s sweet and tender splendor? Last week at the grocery store, when walking past the large displace of perfect butternut squashes, I caved and bought myself the biggest, most beautiful one I could find. Well, I had no choice but to face my fear (there I go again with that) and come up with a recipe worthy of this butternut squash. And folks, I think I did just that with this Vegan Butternut Squash Lasagna. 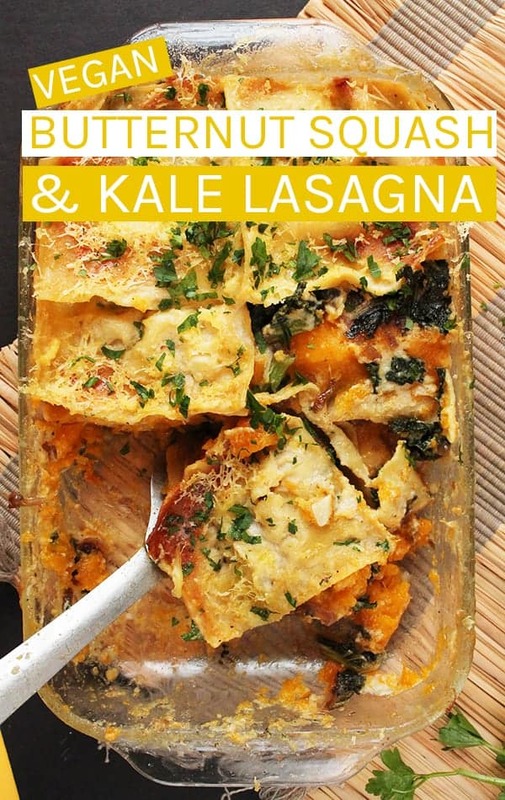 While this vegan Butternut Squash Lasagna recipe is fantastic, it does take a bit of multi-tasking to make it happen. So before you get started make sure you’re kitchen is clean with your mise en place. Okay ready? Let’s go. 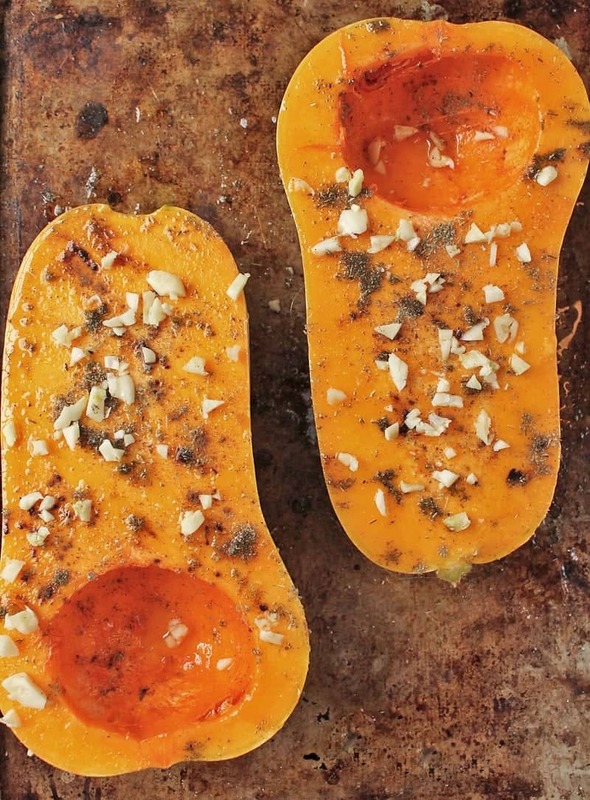 To begin, we’ve got to get those beautiful butternut squash roasting. They get rubbed with garlic and spices and then baked to tender perfection. While they are doing that, you’ve got about 40 minutes to get everything else prepped. The next step is making the Bechamel Sauce. I’ve you’ve never made Bechamel Sauce before, you’re in for a nice surprise. It’s super easy! A little bit of stirring and whisking and stirring and done! Now, let’s move on to the kale. Just a simple sautéd with the onions for a few minutes should do it. While those are cooking you can start that water boiling for your noodles (unless you bought those super cool, no-boil needed lasagna noodles). All right! Squash is out of the oven, Bechamel cooling, kale cooked, and noodles ready. Let’s start assembling. Okay, so your kitchen is a mess and you’ve used nearly every pot and pan BUT now you can put that baby in the oven and start cleaning up. By the time the lasagna is out of the oven, you’ll be sipping on a glass of Cabernet Sauvignon in a clean kitchen with a fancy, fabulous, and totally delicious dinner ready to eat. Sit back and drink some wine. Think you got it? Great. Let’s go! For weekly healthy recipes straight to your inbox, sign up for the My Darling Vegan Newsletter. And when you do you get a FREE copy of my Clean Eating Vegan ebook! To prepare the butternut squash: Preheat the oven to 425. Slice the butternut squash in half, lengthwise. Drizzle with 1 tablespoon of olive oil, sprinkle with garlic, sage, allspice, and salt. Flip the squash over so that the inside is face-down on the baking sheet and bake for 40 minutes, until very tender. 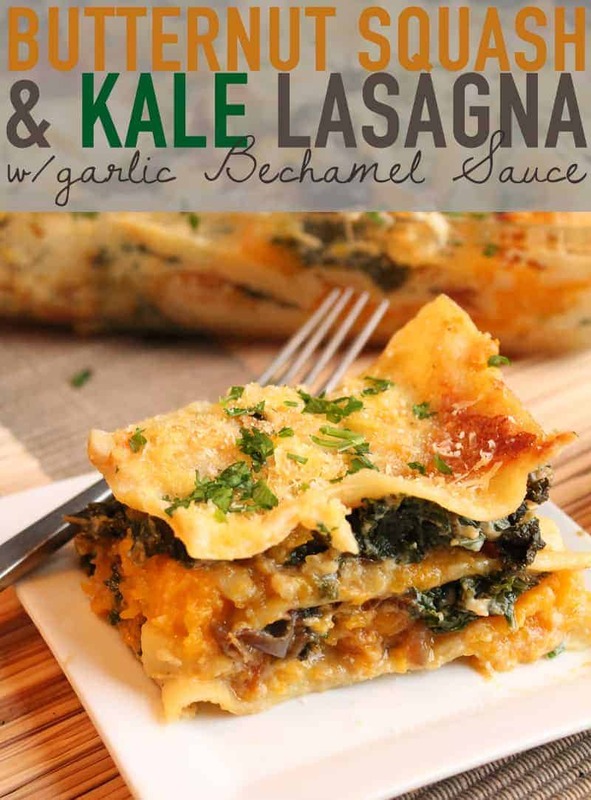 While squash is baking make the Bechamel Sauce (directions below) and prepare the noodles and kale. 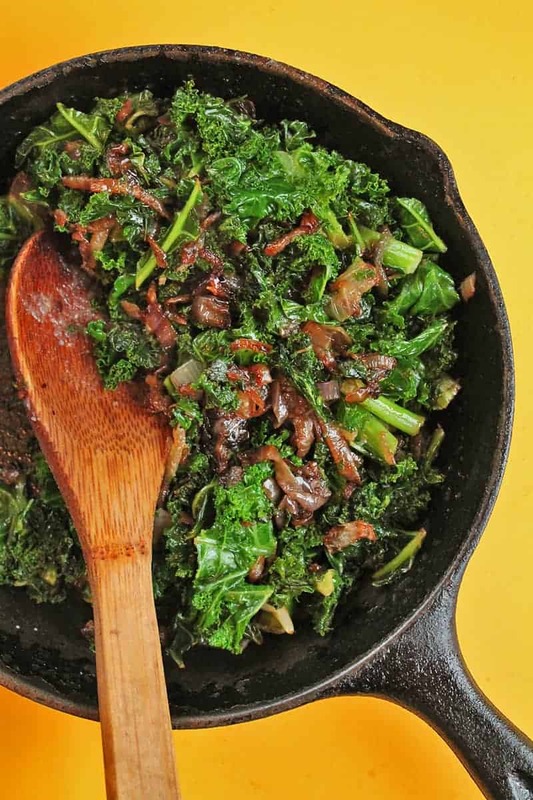 To prepare the kale: In a large sauté pan, heat the additional 1 tablespoon of olive oil over medium-low heat. Add sliced onions and sauté slowly, stirring occasionally, for about 15 minutes. Once onions are soft and lightly browned, stir in chopped kale. Sauté for another 5 minutes until kale is cooked. Boil lasagna noodles in a large pot of water according to packaged directions. When butternut squash is done, remove from heat and reduce oven to 375 degrees. With a spoon scoop out squash from the skin, and mash. Set aside. Heat vegan butter in a medium sauce pan over medium-high heat. Once butter is melted, add flour and stir over heat for 3-4 minutes, until mixture is smooth and golden-brown. In another pot, bring milk, minced garlic, nutmeg, and salt to a boil. Add hot milk to butter/flour mixture in 3 batches. Bring to a boil, whisking often, then reduce heat to a simmer. Cook for 10 minutes, whisking constantly. Once thick and creamy, remove from heat and set aside. Sauce will continue to thicken as it cools. 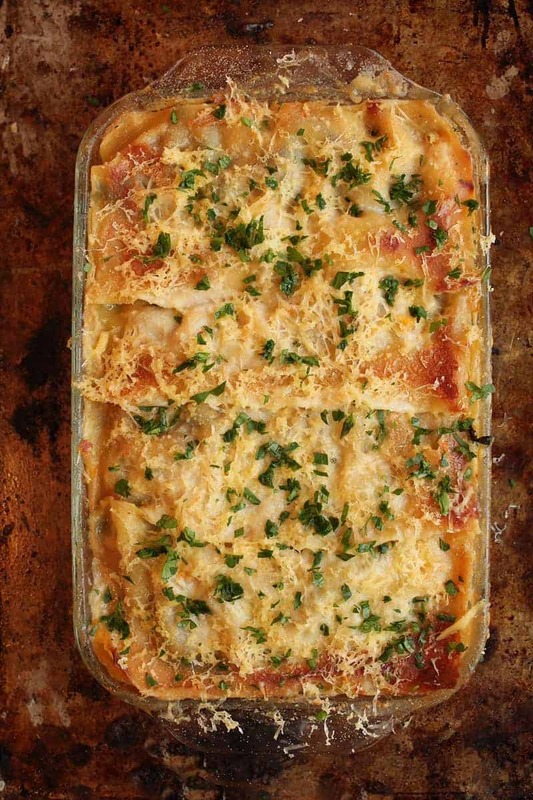 In an 9x13 baking dish, pour a small amount of Bechamel Sauce on the bottom and spread evenly. Lay down a layer of noodles followed by Bechamel Sauce, mashed butternut squash, and then sautéd kale. Top this with more Bechamel Sauce and repeat the process (see photos above). Top with a 3rd layer of noodles and final layer of Bechamel. Cover in foil and bake for 40 minutes. Remove from heat and let cool 15 minutes before slicing. Top with vegan parmesan cheese and/or parsley and serve. Can you assemble 2 days ahead then bake? Yeah, that should be fine. Just make sure to wrap it tightly while storing it in the refrigerator. The lasagna’s in the oven, smelling so delicious! I’m a little confused though, I see nutmeg in the ingredients list (under Béchamel sauce) but I don’t see it mentioned in the actual recipe… am I just missing it?? First of all this was delicious. I adapted a bit and used nut cheese and butter by Miyoko’s. The smoked mozz on it was amazing. I added shiitakes, used brown rice flour to thicken the sauce. I also used the gluten free no boil lasagna noodles. I added an extra 1/2 cup (ish) of water to the pan and covered with foil before baking. Baked 40 mins covered then 20 uncovered. It set perfectly and was so good. Thanks for the spring board. Unfortunately when I went to save it to Pinterest it said the title/description was too long. Hope I don’t loose it in my files! 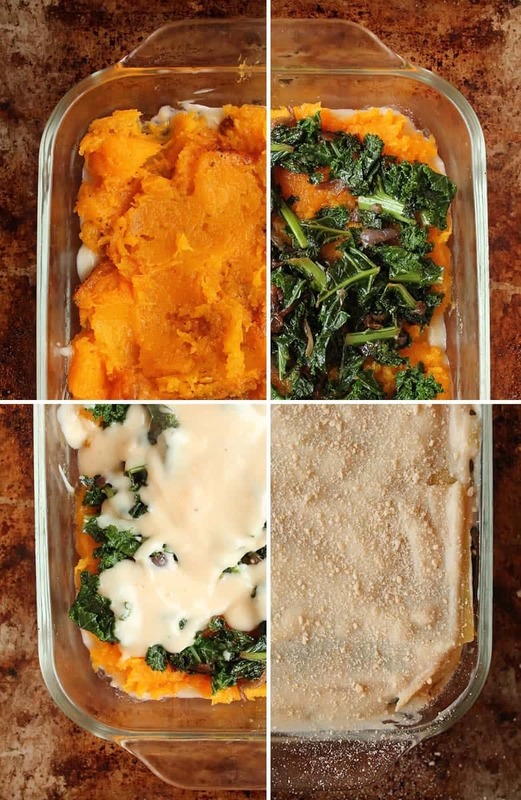 This is inspiring – i love butternut squash and kale. I might try it with a cashew cheese sauce though since I’m not a big fan of processed vegan butter or cheese replacements. Otherwise though it sounds great! This recipe sounds great and I want to try it, To-day. I have unsweetened almond milk, but it’s flavored with Vanilla. Would the vanilla flavoring be too much of a clash in your recipe, or overpowering? Or would it be better to use canned milk (not vegan)? Thanks for the recipe and for your help! I made this with rice lasagna noodles, unsweetened original almond milk instead of soy, king arthur all purpose gluten free flour, and ghee instead of vegan butter. I also added mushrooms to the kale/onion mix and added a layer of country sausage I had on hand, since I’m not vegan, just gluten/dairy free. The bechemel sauce didn’t thicken as much as I think it was supposed to, maybe because of the almond milk/gf flour substitution. Visually, it was kind of messy because it didn’t set like it was supposed to and wouldn’t cut like normal lasagna – it was more spoonfulls in a bowl type thing. But. It tasted. DELICIOUS. My very skeptical husband raved about it and he doesn’t even usually like lasagna that much. The spice combination on the squash was soooo good. I was ready to just sit there eating the squash by itself and forget the rest of the recipe, but I’m glad I didn’t because it ended up being such a great combination of flavors!! Thanks for an awesome recipe that we will definitely come back to again! So glad it was a hit! Thanks for sharing. What is lasagne noodles, I’ve used lasagne sheets and it’s yummy ? Same thing! Might just be called different things regionally. Can I make this ahead of time and freeze it before baking? Then just bake when ready? That should be no problem! This recipe is a game changer! So good and my non-vegan boyfriend was licking his plate. I used zucchini sliced on the mandolin to keep calories down and GF, and added mushrooms to the kale. This recipe will be in the regular rotation! How big is the butternut squash supposed to be? Or how many cups of mashed squash are we going for? I want to try this but not sure if my squash is big enough! Would it work to use marinara instead of the bechamel sauce? The taste would be very different and I’m not sure how compatible the spices I used in the lasagna are with with marinara sauce. If you try it, let us know how it goes! is it just me? I can’t get the recipe link to work. Thanks for your patience. The recipe is back up!